The new performing arts center at the Tuscarawas Campus of Kent State University was designed to bring a renewed cultural vitality to the surrounding region. 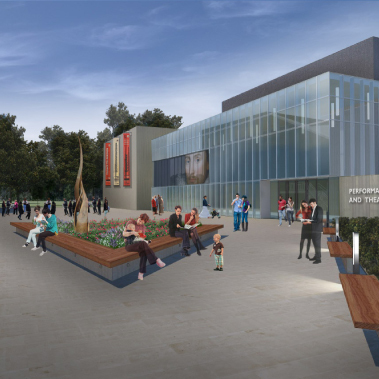 The university’s vision for the performing arts center was to accommodate Off-Broadway and travelling performances for the university and community to enjoy. The building was also programmed to provide for business activities, community functions, and educational programs including receptions, conferences, and music/dance classes. The facility was designed to include a 1,100 seat performance hall, rehearsal spaces, classrooms and a multi-level lobby space for community events. The performance hall features a unique “communicating” balcony which orients patrons closer to the stage and allows for a more intimate seating arrangement than a traditional balcony. Since its completion, the Tuscarawas Performing Arts Center has become a focal point in the Tuscarawas Region. The building’s sculptural quality consisting of flowing shapes of metal, glass, and brick reflects the dynamic activities happening within. Warm tones of wood and cool tones of metal combine to create a rich sequence of interior spaces.